Combine flour, sugar, and salt in a large bowl. Blend in butter using pastry blender or fingertips until mixture resembles coarse meal. Whisk egg, water and vinegar in a small bowl. Add to flour mixture, stirring with a fork until just incorporated. Turn out mixture onto a lightly floured surface. Gently knead until mixture forms a ball. Wrap in plastic wrap and chill for 1 hour. Remove plastic wrap from dough. Roll out on a lightly floured surface to 1/8-inch thickness. Cut out ten 6-inch circles (see note). Refrigerate, covered, until ready to use. NOTE: Use a 6-inch metal bowl as a cutter. Heat oil in large skillet. Add raisins, tomato, peppers, and green onion. Sauté until tender, about 2 minutes. Add pork and tomato paste, stirring until well blended with vegetables. Sprinkle cheese on top of mixture. Place a scant 1/3 cup filling in the center of a dough circle. Moisten edge of half the circle lightly with water. Fold dough over the filling to form a semi-circle. Pinch edge to seal, making sure to eliminate any air pockets. To braid sealed edge, start at one corner of the empanada and fold over a triangle of dough (about 1/2 inch) and pinch. Continue turning and pinching around the sealed edge of the empanada. Assemble empanadas until you have enough to fry. Fry empanadas, 1 or 2 at a time, for 6 to 6 1/2 minutes. Drain on paper towels. Serve warm. 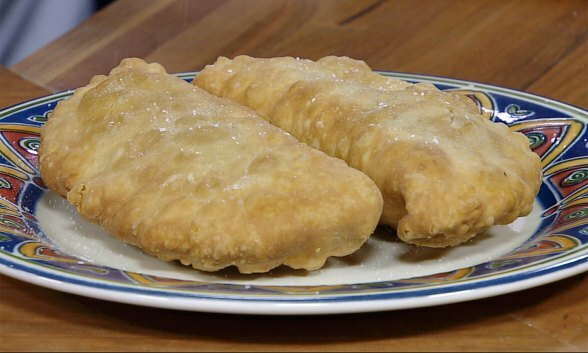 Watch Chef Kevin Belton prepare Sweet and Savory Empanadas in this video. The Pulled Pork can be made 1 to 2 days in advance. This recipe makes a larger batch than what is needed for the empanadas. Save out about 2 cups of pulled pork for the empanadas and serve the remainder with sandwiches. Two meals in one!